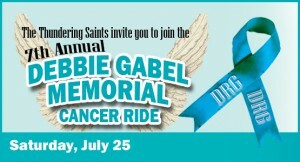 The 7th annual Debbie Gabel Memorial Motorcycle Ride will be held Saturday, July 25, in Valley City. Registration for the motorcycle ride begins at 9 a.m. at Boomer’s Corner Keg. The ride begins at noon and ends at approximately 5:30 p.m. The cost to participate is $25 per rider and $15 per co-pilot. Food is included in the registration fee and will be served after the ride at Boomer’s Corner Keg. A live auction will be held at the same location at 7 p.m. One registered participant will win $500 cash! A street dance, featuring music by Blackwater, will be held after the ride. Last year, approximately 150 people participated in the motorcycle ride. Net proceeds of the events benefit Hospice of the Red River Valley. For more information, go to www.thunderingsaints.com.